In a recent “Today, Explained” podcast, the narrators were discussing the recent Supreme Court decisions involving arbitration and the American worker. In essence, the Supreme Court ruled in favor of a 1925 law that stated that Corporations have the right to force arbitration (Federal Arbitration Act of 1925 is the name of the law) clauses into many, if not all, types of contracts, including those that involve a contract to work. What this does is overturn a New Deal-Era law (National Labor Relations Act of 1935) that stated that employees had the right to work in concert with each other for their mutual benefit. What does this mean? No Class-Action lawsuits for employees when wrongfully treated by their employers. For the nitty-gritty details, the podcast is recommended. In general, it means that arbitration clauses can now be put into nearly any contract and are binding. Employees who have been sexually harassed, been denied wages, or otherwise wrongfully treated during employment must now seek arbitration for grievances rather than a lawsuit. Where this has the most implication is when there are many injured in the workplace but have little ability, financially or otherwise, to stop ongoing wrongful acts. Many people and corporations think this is a good thing; law suits are a burden on more than just the plaintiff or defendant. They are a burden on the taxpayers and the court systems – sometimes causing far more difficulties than they solve. However, taken in the context of several court decisions in recent years, it should give the people of the United States something, perhaps, to consider. This decision, by the Supreme Court, in effect provides corporations with a great deal of power and the individual, the worker, with very little. Like Citizen’s United, this is an example of corporate legal power leveraging the judicial system of the country to produce vast corporate influence on the American political and social landscape; in essence, corporations are circumventing the executive and legislative branches of government, and using the judicial system to create a very corporate-forward, individual-backward landscape. People are often fond of saying that the United States is becoming an oligarchy, where government is the hands of a few people. What they are really trying to say, though, is that America has become a Corporatocracy. Economist Jeffery Sachs, in The Price of Civilization, stated that America is, in effect, a corporatocracy in which “powerful corporate interest groups dominate the policy agenda.” He gives four reasons for this being the case: 1) weak national political parties, 2) strong political representation of individual districts, 3) globalization weakening the power of employees, and 4) large corporations financing political campaigns for their own agendas. Is a corporatocracy in keeping with the values of Freemasonry? One might equate the “military-industrial complex” as perhaps a single, corporate power. 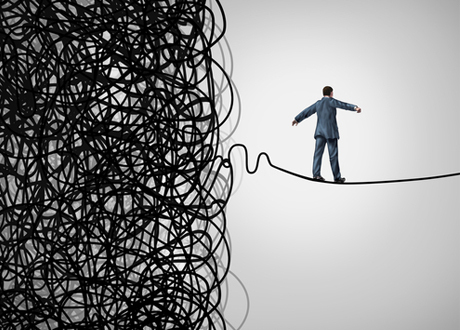 I see in the near future a crisis approaching that unnerves me and causes me to tremble for the safety of my country. …corporations have been enthroned and an era of corruption in high places will follow, and the money power of the country will endeavor to prolong its reign by working upon the prejudices of the people until all wealth is aggregated in a few hands and the Republic is destroyed. Others throughout history have weighed in on the idea of corporations, from writers to inventors to even businessmen themselves. ~ James Fenimore Cooper, The American Democrat, 1838. Great corporations exist only because they are created and safeguarded by our institutions; and it is therefore our right and our duty to see that they work in harmony with those institutions. ~ President and Freemason, Theodore Roosevelt, 1901, first annual message to Congress. Thomas Jefferson, the man who wanted an amendment to the Constitution prohibiting monopoly, would be aghast at our billion-dollar corporations. Jefferson, who abolished primogeniture and entail in Virginia in order to prevent monopoly in land, would be appalled by our high percentage of tenancy. Jefferson as the man who dreaded the day when many of our citizens might become landless, would perhaps feel our civilization was trembling on the brink of ruin, if he were to find so many of our people without either land or tools, and subject to the hire and power of distant corporations. If the Jefferson of 1820 could see his name used by men crying `States’ rights!’ in order to protect not individual liberties but corporate property, then he would shudder. ~ Henry A. Wallace, November 17, 1937, former populist U.S. Secretary of Agriculture and Vice-President of the United States. The United States is a democratic republic, or a representative democracy, a sordid mix of Greek and Roman ideals, thrown together in some kind of weird experiment that has yet to play itself out. Yet, the overt goal in the foundation of this country was that the people themselves should have a say in the government of it – true individual representation – not the boards of directors of a few, extremely large and wealthy corporations. Corporations are not structured to be democratic nor a republic; they are in truth, oligarchies. So, what is the United States? Is it any better or worse off than anywhere else in the world? Has the grand experiment worked to the satisfaction of our founding fathers, some of whom held the ideals of Freemasonry? The experiment is still very much a living organism. Freemasonry itself is not a democracy; it is not a dictatorship, nor a republic. Each Master Mason has a vote, but not all Freemasons have a vote. Majority rules, not plurality. However, the Master of the Lodge is the voice of the Lodge, the final “say,” when it comes to matters of some Masonic jurisprudence – a sort-of dictator. However, the Master of the Lodge does not always have the final say. He may be a tie-breaker in votes but he typically does not have a vote on general matters. But each Lodge is not an independent body; they tie back to either a Grand Lodge, Supreme Council, or other Supreme body governing the rules and regulations of their order. Each individual Lodge is represented to their Grand Lodge by a single vote made up of the votes of the Lodge. Therefore, the Lodge is a representative to the Grand Lodge for the individual, ergo a republic. 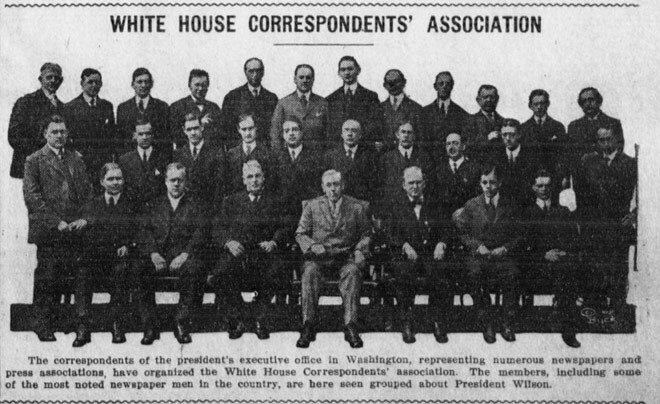 If we’re not sure what the United States’ Government is, we may be just as confused as to the government of the system of Freemasonry. Why bring all this up in a blog on philosophical debates of interest to Freemasons? This is not to stir the passions of partisanship or state that Freemasonry itself should be political. 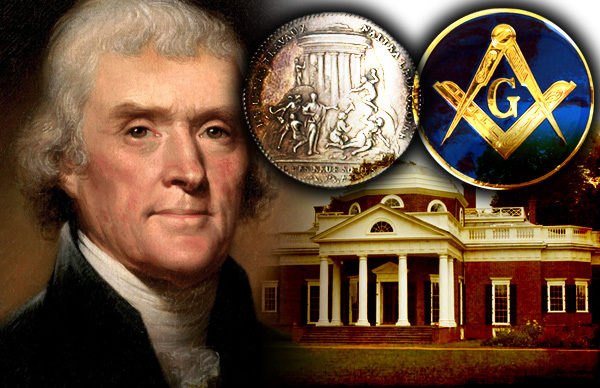 It is simply because Freemasons, especially within the United States, are inextricably linked to government. The motto of “Liberty, Equality, and Fraternity’ are on the lips of every Freemason at one time or another, whether spoken in rote repetition or with true feeling. Freemasons should ask these hard and difficult questions in order to shape the world we live in as well as the groups to which they belong. We should be unafraid to discuss the ideals of government, religion, and all aspects of life. While it is not within the purview of Freemasonry as an institution to take a political stance, should the Freemason make his individual voice heard, in representation of what he or she feels is liberty, equality, and fraternity? Global governance is shifting, perhaps trying to find a new way of being. It behooves us, no matter what we believe in keeping, be it a corporatocracy, oligarchy, plutocracy, theocracy, democracy, or republic, to be the voices of what the future holds. This is something that perhaps Freemasons should discuss, in educated, philosophical terms, and let the debate ensue. No one creates in a vacuum and no one creates change without speaking up. New ways of thinking evolve from educated, passionate, and respectful debate. If Freemasons are working to be leaders within humanity, these discussions should be on their tongues and not remain in the shadows of their hearts. If those who are working toward the perfecting of humanity don’t speak up, and take responsibility for shaping their nations, then who? The Caucus, Primary, and National Party Conventions: How Has History Shaped the Presidential Nomination Process? How do U.S. political parties nominate a candidate for President? To win the nomination in one of the parties, the candidate collects pledges from a majority of the delegates to the parties’ National Conventions, currently held during the summer before November’s general election. There are three methods used presently to allocate delegates to presidential contenders: 1) the Caucus System, 2) the Primary System, or 3) a combination of the two. To determine their candidate, each state hold’s a political contest, referred to as a caucus or primary. The caucus method is organized by the political parties, whereas, primaries are organized and overseen by the State government. The candidate who secures the highest number of delegates at the political convention wins the nomination and competes in the general election. How has history shaped this nomination process, and how did Freemasonry impact the evolution of that process? As the older method of choosing delegates, the caucus system was utilized by all States in the Union until the 1832 election. The term “caucus” is derived from Latin origin, meaning, “a drinking vessel” and was used to describe informal local po litical clubs prior to the forming of the United States. A caucus is defined as “a meeting of a political group to select candidates, plan strategy, or make decisions regarding legislative matters.” In the nominating process, a caucus is a local meeting where registered members of a party gather to select a delegate that may represent them at the National Convention. In most states, the attendees at the precinct caucus vote for their preferred party candidate, which informs and directs a percentage of the State’s delegation at the National Party Convention. In 2016, approximately 123,500 Democratic voters in Colorado attended their local caucus on March 1st and voted to select a party candidate. In contrast, the Republican Party in Colorado decided to forgo voting for a candidate in their precinct caucuses and only selected delegates for their future convention. This means that of the 5.5 million citizens of Colorado, only 2.2 percent of the population voted to select a Presidential candidate for the 2016 general election. In 2016, thirteen states (Iowa, Nevada, Colorado, Minnesota, Kansas, Nebraska, Maine, Idaho, Utah, Alaska, Hawaii, Washington, and Wyoming) utilized the caucus system. In most states, only registered voters can participate in a caucus, and they are limited to the caucus of the party with which they are affiliated. Caucuses are typically used in combination with congressional district assemblies and a state convention to elect delegates to the national nominating convention for presidential elections. A primary is a state-run process of selecting candidates and delegates, where the results are used to determine the configuration of delegates at the national convention of each party. Unlike caucuses, primaries are conducted at regular polling stations, paid for by the state, and overseen by state election officials. Voters cast a secret ballot for their preferred candidate, as compared to caucuses where the voting is done in a group forum usually by a show of hands or breaking into groups based on support. In 2016, thirty-seven U.S. states (New Hampshire, South Carolina, Alabama, Arkansas, Georgia, Massachusetts, Oklahoma, Tennessee, Texas, Vermont, Virginia, Louisiana, Michigan, Mississippi, Florida, Illinois, Missouri, North Carolina, Ohio, Arizona, Wisconsin, New York, Connecticut, Delaware, Maryland, Pennsylvania, Rhode Island, Indiana, West Virginia, Kentucky, Oregon, California, Montana, New Jersey, New Mexico, North Dakota, and South Dakota) and the District of Columbia will conduct a primary election. Voter participation tends to be significantly higher in primaries. In 2016, more than 1.5 million citizens of the state of Missouri voted to nominate candidates for president. With approximately 6 million people living in Missouri, this equates to 25 percent of the population voting for a presidential candidate. There are several types of primaries in the U.S. system: closed primary, semi-closed primary, open primary, and semi-open primary. Closed primary: Participation is open only to a particular political party’s registered members. Independents or other party members cannot participate. Florida holds a closed primary. Semi-closed primary: Participation is open to registered party members and unaffiliated voters. 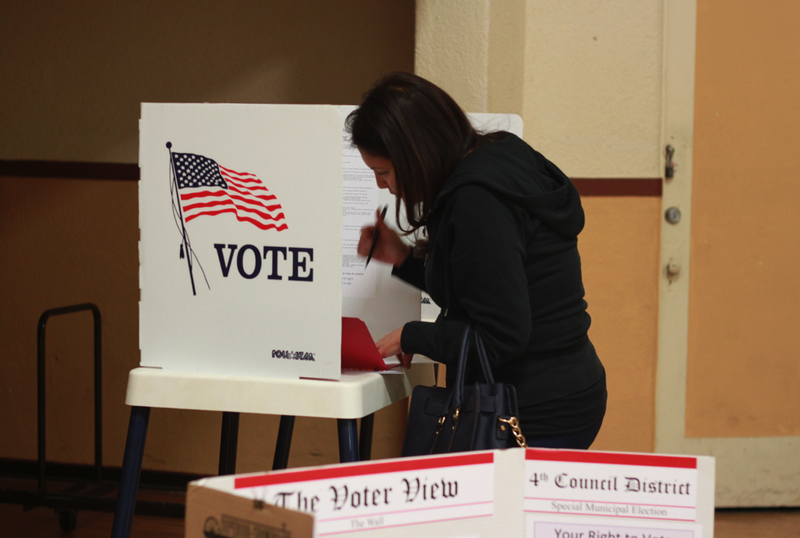 State election rules determine whether unaffiliated voters may make their choice. New Hampshire holds a semi-closed primary. Open primary: Any registered voter may participate in any party primary. Illinois holds an open primary. Semi-open primary: Any registered voter may participate in any party primary but when they identify themselves to election officials, they must request a party’s specific ballot. Ohio holds a semi-open primary. Prior to the 1970s, most states utilized the caucus system to choose their delegates, but public outcry over corruption by political bosses led to substantial changes in the process for the 1972 election. The caucus system favored powerful leaders with pull in their delegation like famous party boss Mayor Daley of Chicago. In 1968, CBS reporter, Martin Plissner, stated, “If Daley instructs the Illinois delegates to vote for Ho Chi Minh, all but twenty votes will go to Ho Chi Minh without question.” In an effort to make the nomination process more inclusive and transparent, most states have moved to the primary system. 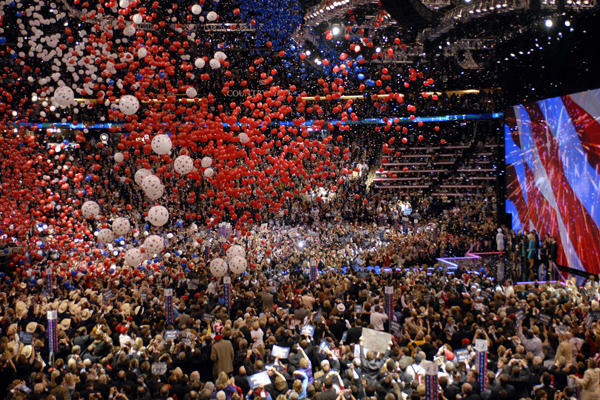 Every four years, a political party national convention is hosted, usually in the summer, by the major political parties who field nominees in the upcoming U.S. presidential election in November. The purpose of the national convention is to select the party’s nominee for President, adopt a policy platform, and adopt the rules for the party’s activities for the next election cycle. During the convention, a roll call of the votes is held, where each state delegation announces its vote totals. If no candidate secures a majority of delegates during the first vote, a “Brokered Convention” in invoked. In a brokered convention, most pledged delegates are released from their agreements to support a specific candidate and delegates are then able to switch their allegiance to a different candidate. The party nomination is then decided through a process of debate and rounds re-voting until a candidate is selected. Andrew Jackson, a Freemason and Grand Master of the Grand Lodge of Tennessee (1822-1824), was among the most strident critics of the caucus method of selecting candidates. In his 1828 presidential bid, Jackson ran with the vocalized intent of restoring the voice of the people to the election process. As a man of the people, Andrew Jackson argued that the caucus system was elitist and undemocratic, as only a small percentage of the population was engaged in the process. Jackson pledged that he would open up the system to increase the political power of the electorate, and he proposed to eliminate the Electoral College and institute a direct popular election of the president. Jackson argued, ” Our government is founded upon the intelligence of the people. I for one do not despair of the republic. I have great confidence in the virtue of the great majority of the people, and I cannot fear the result.” The election of 1828 was described as a “triumph of democratic politics,” in which more than 1.1 million men participated compared to only 300,000 in 1824. Andrew Jackson was elected U.S. President in 1828 and was re-elected in 1832. In 1832, national conventions were held by the political parties, including the Anti-Masonic Party which held its convention in Baltimore, Maryland on September 26, 1831 to select William Wirt as their Presidential candidate. 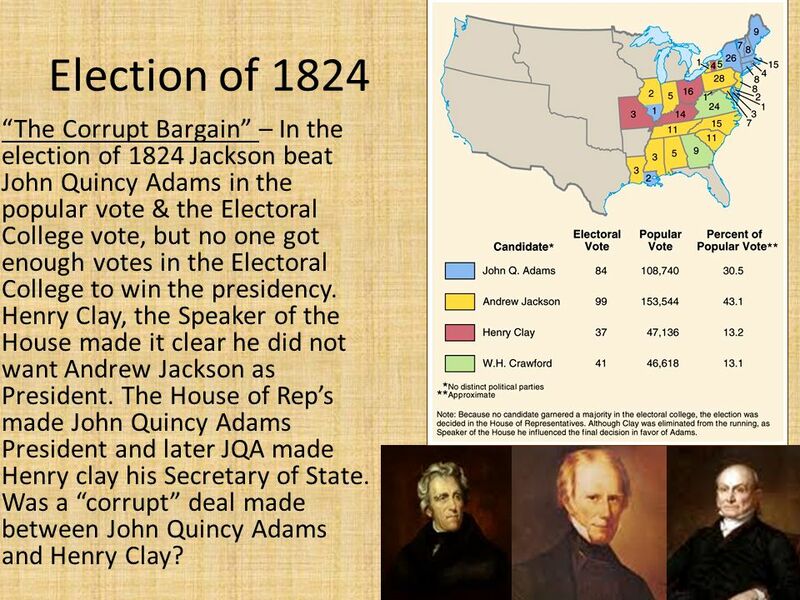 President Andrew Jackson, candidate of the Democratic Party, won re-election against Henry Clay the candidate of the National Republican Party, and William Wirt the candidate of the Anti-Masonic Party. Jackson won with 219 of the 286 electoral votes cast in the national election.